I have gotten to the point in my journey to run at least a half marathon in all fifty states where there are no longer easy states to do, with the exception of Iowa. I realized this many months ago, where I saw that I had knocked out the nearby Midwest states and, for the most part, any city that is connected to Chicago by cheap airfare. I was very quickly running out of “convenient” races and had to start planning out my time off the beaten path. 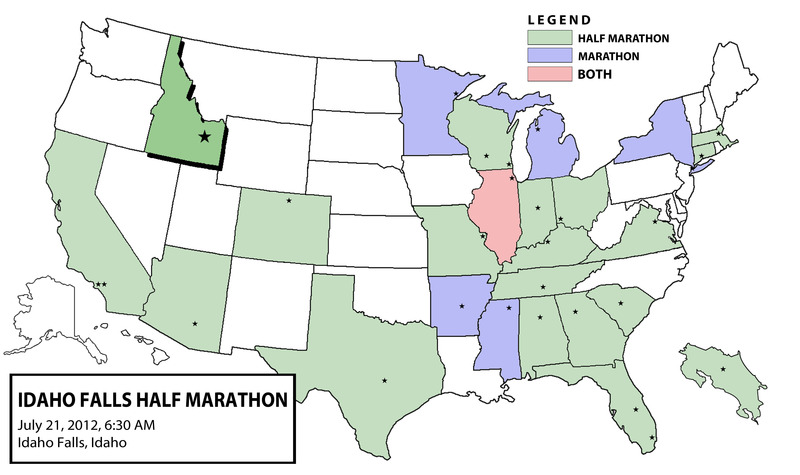 In a moment of both genius and delirium, I decided that, to maximize my time and money, I’d try and double-up – two half marathons in two different states in one weekend. It would be a half-and-half, if you will. 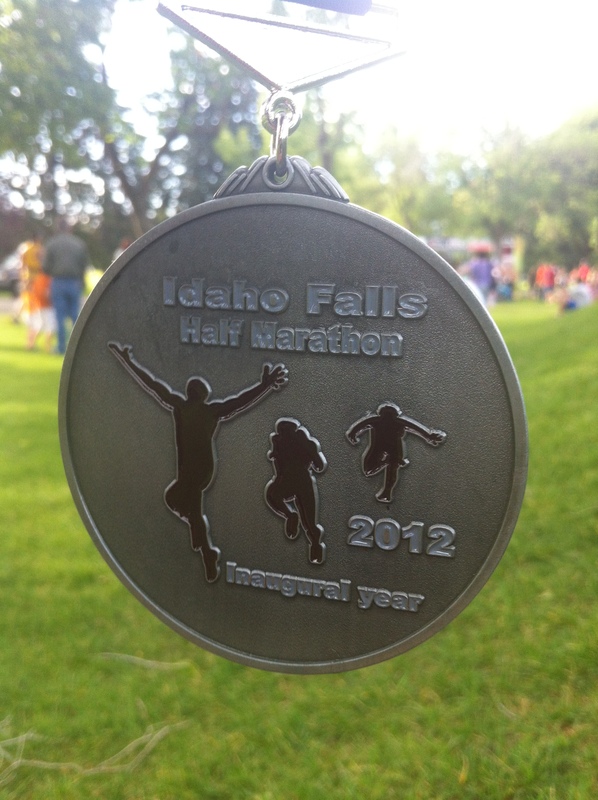 So I decided to sign up and plan a trip for the inaugural Idaho Falls Half Marathon and the next day run the Madison Montana Half Marathon. Of course, running two half marathons in one weekend isn’t always advisable. An ex-coworker with a 2:57 marathon PR once shied me away from it back when my plan was to run the Kentucky Derby Festival and the Cincinnati Flying Pig back to back. Those were relatively flat and at sea level. Fast forward over a year later and I’m ignoring his advice to run two races, one at 6,000 feet, the other at 9,000. Sure, I knew it would be a challenge, but my sense of adventure got the best of me. When it came time to find lodging, I thought back to my trip to Mississippi for the Tupelo Marathon last September. I went by myself, got a hotel room, ran the race, and flew back. As excited as I was that I had finished a notoriously difficult race, I felt like I didn’t really do anything with my free time there besides watch a bootleg copy of Game of Thrones. So with this trip, I further humored my sense of adventure by looking for a willing host via couchsurfing.org. For the unfamiliar, couchsurfing.org is a website where users can ask for “couches” on which they can crash for a few days, weeks or even months, from regular folks. Similarly, they can also offer their own “couch” to the community for wayfarers and nomads to use. I had heard of it a few years ago but didn’t think much of it until a fellow running blogger, Aurora, mentioned that she’s used it more than once to help cut the costs of her race budget. So I signed up and looked around Idaho Falls for someone willing to let me stay at their place. One quick search and I found Rich and Shari, a couple in their 60s, who had just recently signed up to the site themselves. I sent them a message along with a link to my blog and they graciously accepted. For a few logistical and planning reasons, when I arrived at their house, no one was home. I told Shari that I could easily entertain myself by driving around a new city, but she said it’d be okay with her if I went in through the garage. Just like that. Yes, complete stranger, you may enter our house. That takes a metric ton of trust, I thought. I guess my blog, which I hoped would serve as a deposit on my character and standing, worked very well. So I made myself at home on a beanbag in the living room (not a couch, as one might expect from the site that made this possible) and napped for about three hours. Did I mention that I had gone to a midnight screening of The Dark Knight Rises before my 6 AM flight? Yeah, I needed that nap. I spent the rest of the night getting to know my hosts. Though I only said hi to Rich briefly, I spent plenty of time getting to know Shari. 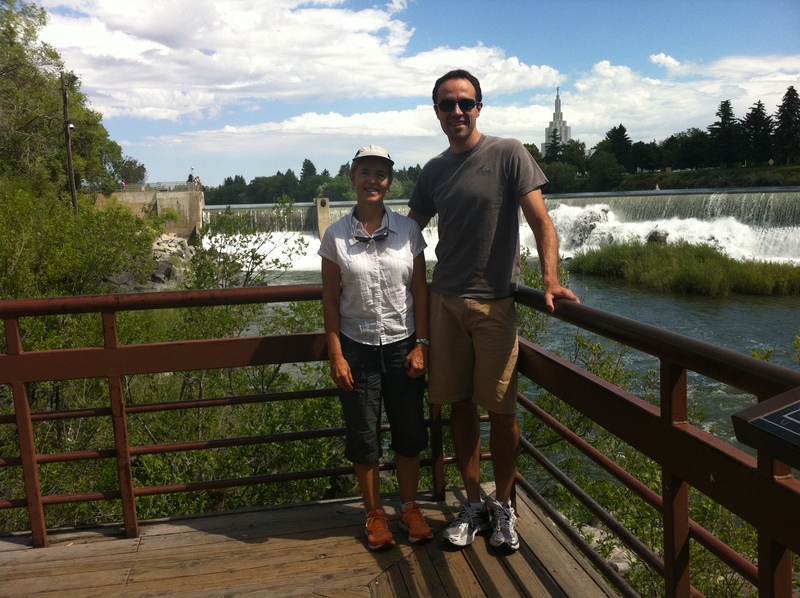 Though originally from Denver, she has lived in Idaho Falls for over 30 years and doesn’t plan on leaving. She is a music teacher, a devoted gardener and a doting host. She and Rich are approaching their tenth anniversary, which was a bit of a surprise for me. I tend to assume (like most people, perhaps) that your significant other in your 60s has been with you for all your life. But although Rich, a windsurfer and builder with a grey and white beard, went to high school with Shari, they didn’t reconnect until ten years ago, allowing plenty of time for each to live completely separate lives. They are quite the remarkable couple. 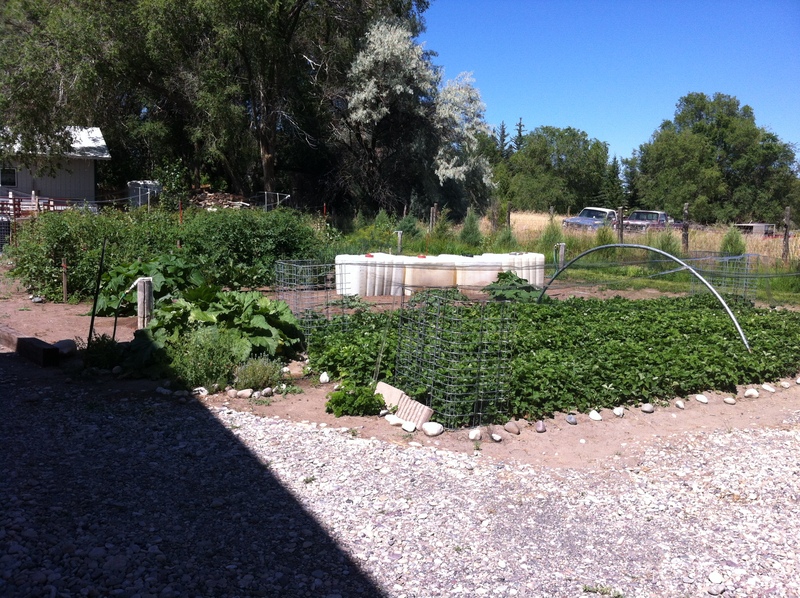 Not only are they building a house themselves in the nearby community of Woodfield, but they grow their own produce in a large garden and even make their own fuel. I was treated to several bowls of fresh raspberries and many slices of homemade bread, much to my delight. I also got a chance to meet lots of Shari’s family and in the process, earned my stay by helping one of her daughters move into a new house just a block away from the shores of the Snake River. All of that happened after the half marathon Saturday morning. I woke up at 4:30 and hopped in my rental (a Nissan Sentra again) and drove out to Tautphaus Park (pronounced taw-fuss), where a bus would take me to the start. 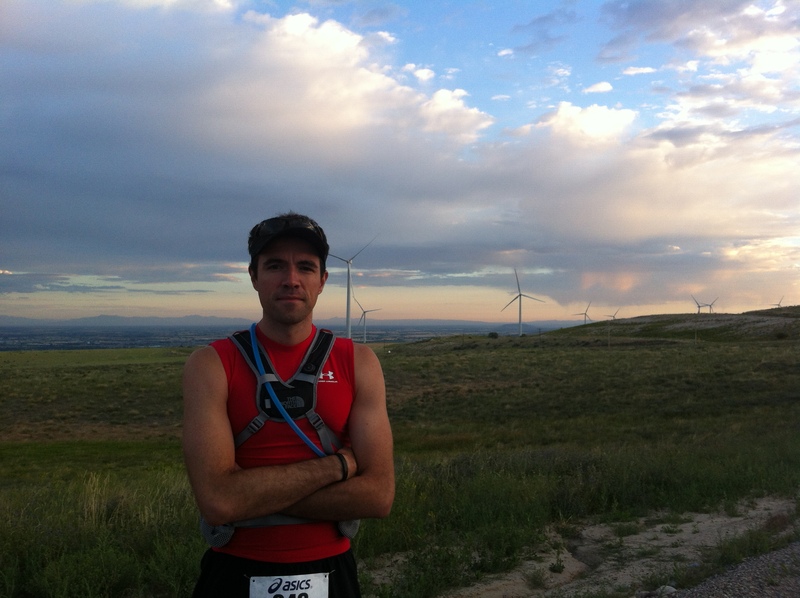 The race is a net downhill point to point, which starts off at the top of a mountainous area that I only know as “the foothills,” upon which were built many wind turbines. The bus kept climbing and climbing, the slope not at all gradual, which prompted many runners to exchange nervous glances. We all knew it would be downhill, but not so down. By the time we reached the top, the sun was trying to muscle its way through the scattered clouds with darker clumps hovering menacingly over the city below. It only took about four buses to get the entire field of runners to the start. But even a small field of about 200 people will make huge lines when there are only three portapotties. Fortunately, the organizers were nice enough to delay the start of the race by about fifteen minutes to make sure everyone had time to line up behind the start mat. Running downhill is tricky. If it’s a slight downhill, then you’re free to run faster with less effort and in doing so, feel like a demigod. However, if it’s a significant downward slope, then you either end up leaning back and putting some undue stress on your quads and back, or gunning it downhill with reckless abandon. I did the latter just two weeks ago in Costa Rica. At first, it’s delightful. You’re taking huge strides, flying over the pavement as if the road were suddenly one long trampoline. But then it flattens out and you come crashing down from your sugar high and get sad. I decided to avoid this mistake by holding back as much as I could without feeling like I was lying down with my face to the sky. But even so, I was still cruising downhill at a 7:30 pace. 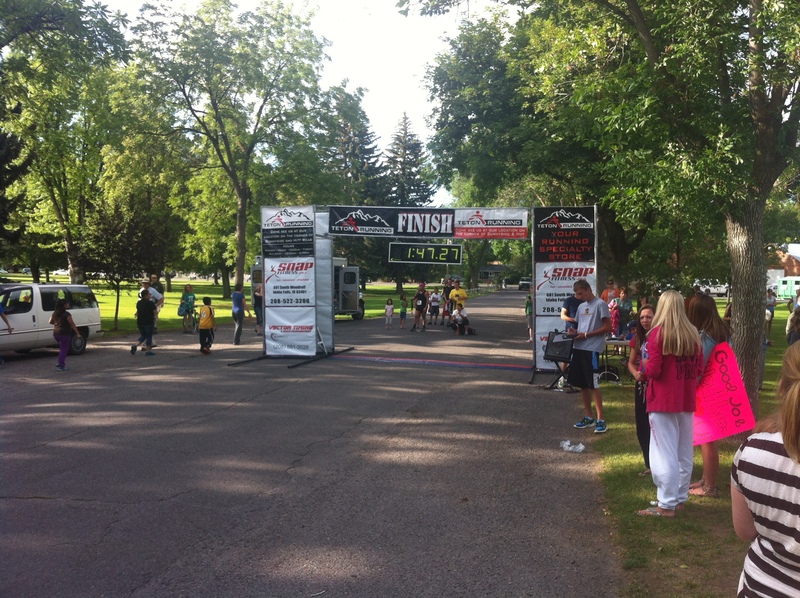 This was the first half marathon that I run where I told myself I wouldn’t go fast. 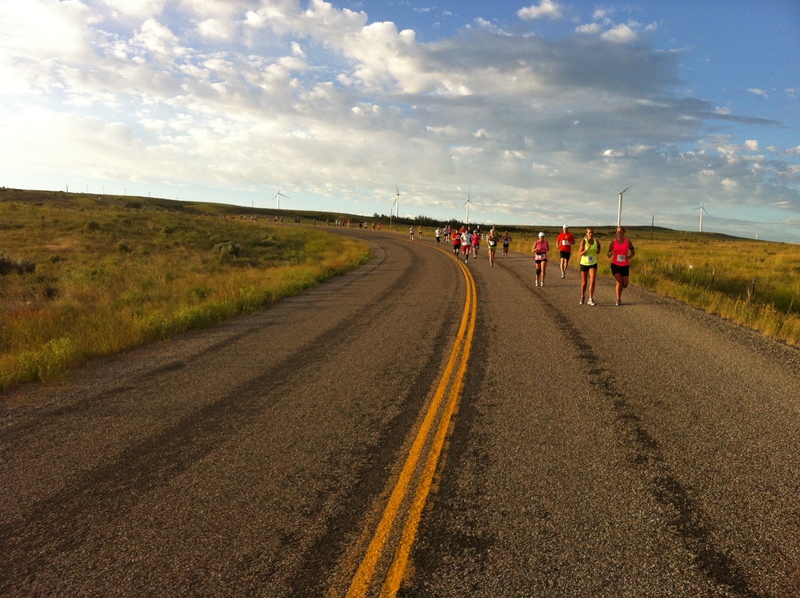 Sunday’s race in Montana would be tough enough on fresh legs and here I was doing a 13.1-mile “warm-up” run. I wouldn’t screw it up by trying to get a good time and wrecking my legs in the process. And yet, I might have done more damage to my legs had I tried to hold back and slow gravity’s relentless pull to an 8-minute pace. That would come later, when the course would flatten out at mile 7. But while the downhill lasted, I made sure to enjoy the scenery. 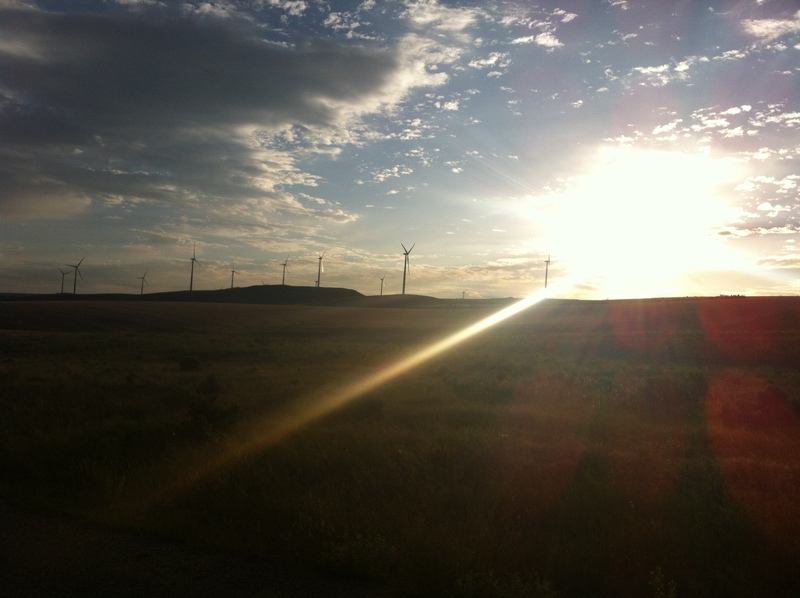 The turbines receded behind me, like sentinels guarding over the city. It was very quiet; the only noises I could hear were feet hitting the pavement and water sloshing in my reservoir. To my right, the sun was cresting over the foothills, casting a distant shadow of a sinewy runner over clumps of tall grass. 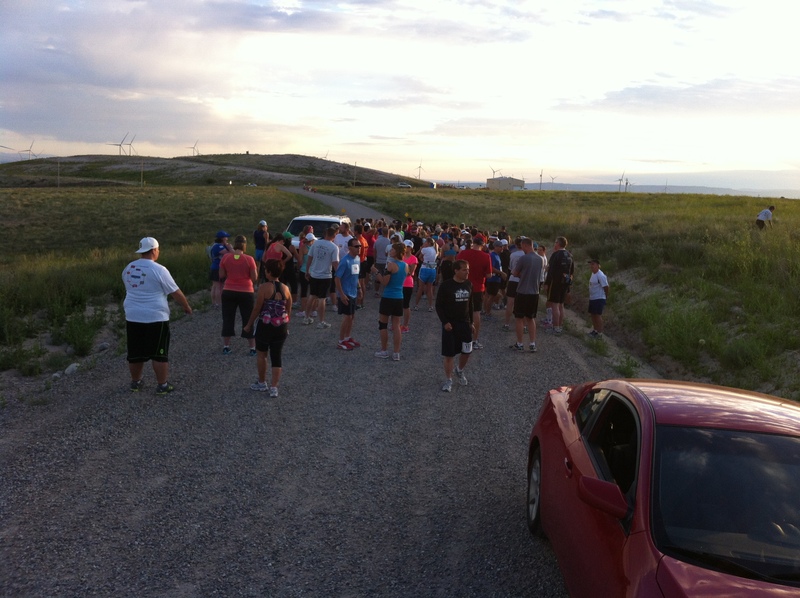 Race organizers implored that we stay on the roads because these fields were known to house rattlesnakes. There would be about five miles of this scenic descent before the course would start flattening out. There was only one climb, right at mile 3. I remember feeling almost relieved to be able to finally lean forward a bit. But that relief lasted very little and not because I didn’t like going uphill. There was a little voice in the back of my head that said I’d be hating uphills in less than twenty-four hours. We’ll cross that bridge when we get to it. By mile 7, there were no more hills to speak of. We were running on the sidewalks of Sunnyside Road, volunteers positioned at major intersections, holding cars at bay with large, orange flags. I made sure to thank each one as I ran past them at a stable 8:25 pace. Though it was slow by my standards, I could definitely feel the 5,000 feet of altitude. From the first quarter mile, my tongue and throat felt dry, but my lungs were in good shape. Now on flat terrain, I noticed that I couldn’t have accelerated to a 7:30 pace again if I wanted to. Though I wasn’t completely tired or falling apart, it was a foreboding sign of the next day’s struggle (which, as of this writing, has not yet happened). Just before the ninth mile, the course turned right onto Hitt Street for a half mile of commercial strip malls. This was easily my least favorite part of the course, but it was a necessary evil to get back to Tautphaus Park and the finish line. By mile 11 we were running through neighborhoods and on sidewalks with a thick tree canopy. I kept my steady pace, slowly reeling in runners that had slowed down, passing them, and moving onwards. I felt good. It made me wonder if this was what most 50-state runners do – run the race for fun, and not to earn a competitive time. As I plodded along at a sustainable, easy pace, I found myself asking if it was the kind of running I wanted to do. I kept leaning towards no. Unless there’s a good reason, I want every race to be one where I snarl my way to the finish. Maybe I could pick it up in the last mile and finish hard … but I told myself to not go nuts. Today there was a good reason to take it slow. But this furtive thought had already snuck its way into my stride at mile 12. I started moving a little faster, lifting my arms a little more to build momentum. I’d show everyone I’m much faster than this! But as quickly as it started, it ended. Maybe my body had gotten used to the relaxed pace and subconsciously pulled me back into it. Or, perhaps more likely, I was more tired than I was willing to admit. So once back into the park, I ran a large loop around softball fields, through parking lots and into a small, almost single-track trail, before crossing the finish line in 1:47:22. The post-race amenities included thick slices of Great Harvest bread, Kiwi Loco yogurt and mini Jimmy John’s sandwiches. Twenty-four states done! I took my finisher’s treats to the side of a grassy hill and ate away. It would be the first time that I finish a race without the freedom to eat irresponsibly for the remainder of the day. Instead, I had to reload for the next morning while at the same time nursing my legs. They weren’t sore or tired, but I knew that the downhill would come back to haunt me. As of this writing, I feel alright, but get a warm twinge in my quads when I go down stairs. Is it too much to ask that the post-race atrophy wait another 24 hours? Despite the unusual self-characterization, I made several friends that afternoon. Later in the day, I’d also end up hauling a very heavy washing machine from a storage unit to the truck and then into the house, which earned me more popularity. I figure, I’d be using my legs a lot this weekend, why not give my arms something to do? I also made sure to eat as many fruits as possible, knowing I had to replenish and then restock. I had a Clif bar in my pocket at all times and was never more than ten feet away from a bottle of water. 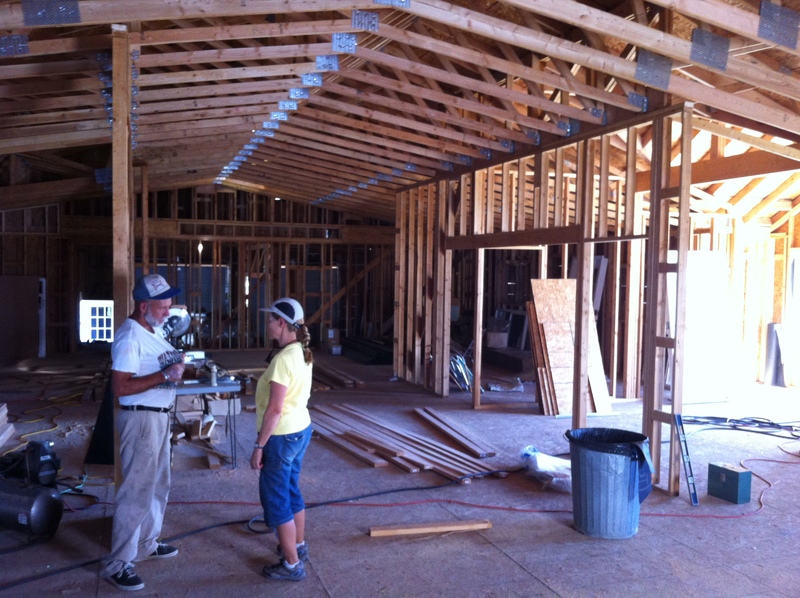 I ended the day by visiting Shari and Rich’s new house, the one that they are building completely by themselves. The idea is so daunting that I can’t help but marvel at the sheer dedication and patience it must take. I give myself a gold star and smirk for an hour if I can put together IKEA furniture or hang a picture and these people are building an entire house. And if that weren’t impressive enough, they spend the entire winter in Mexico’s Baja Peninsula where they are building another house. I guess that’s what you do when you’ve lived a fulfilling life and still have tons of energy to continue conquering the world. So even if tomorrow’s race is a huge disaster, I can at least say that the weekend was a very memorable success. I got to meet a wonderful couple while enjoying their generous hospitality in a completely new and beautiful state. I told Shari that if I ever come back to Idaho for a full marathon, that I would stop and visit their new house to see where all the walls end up going. But first, let’s get back to reality. Once I finish writing this, I will start the drive to Ennis, Montana around 2 in the morning with a car full of heavy metal albums and a belly buzzing with nerves. Awesome recap, especially for a totally random stranger! LOL! The people out there seem very friendly. Would love to run there some day. Congrats on your race, Dan. And I’m so happy to hear that couch surfing worked out so well! Human beings can be so amazing sometimes. It’s so lovely when you get to have such a wonderful experience with people who were strangers just that day. Dan – I LOVE your blog. You were so kind with your words about Rich and I. It was a total pleasure to meet you and house you. A BIG thanks for all your work and you WILL come to visit again (with your bride this time)…I know it! Glad you came to run the race and had a good time! Maybe we’ll make a full marathon version one of these years, so you can come back. 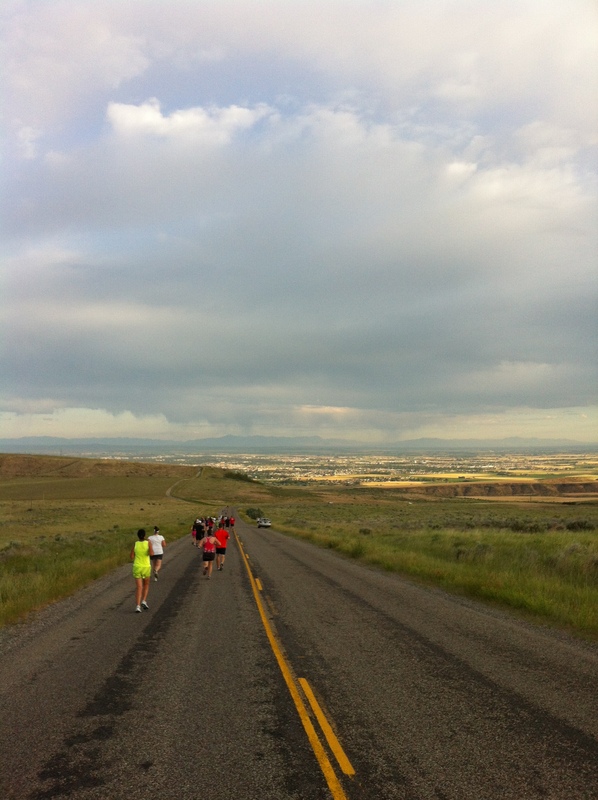 I also recommend the Pocatello Marathon, which is a superb race. Well, reading this blog just gave me a new mechanism to use to meet people, so I guess you should prepare yourself for my future blog entries about total strangers I meet while sleeping on their couches. That is pretty cool! And look at you running a race for fun! You make friends with strangers better than anyone I know. Congratulations on #24. Sounds like it was a beautiful course.